Take your kitchen with you. The most versatile outdoor cooking stove around. Portable, collapsible multi-fuel BBQ Grill, Pizza Oven, Rotisserie, Smoker and much more! This unique telescopic design allows you to cater for more people with greater portability. Designed to be easily dismantled and carried within a specially designed backpack. From Pizza to slow roasts the choice of food is endless. The Aquaforno can be configured easily to roast, smoke or grill . Or if you’re feeling lucky, all three at once! An integrated water boiler. Meaning that you have a supply of hot water on demand, for cooking, cleaning or otherwise. Oh, no need to thank us, we made this with you in mind. They like it, so will you. Now available, the little sister. 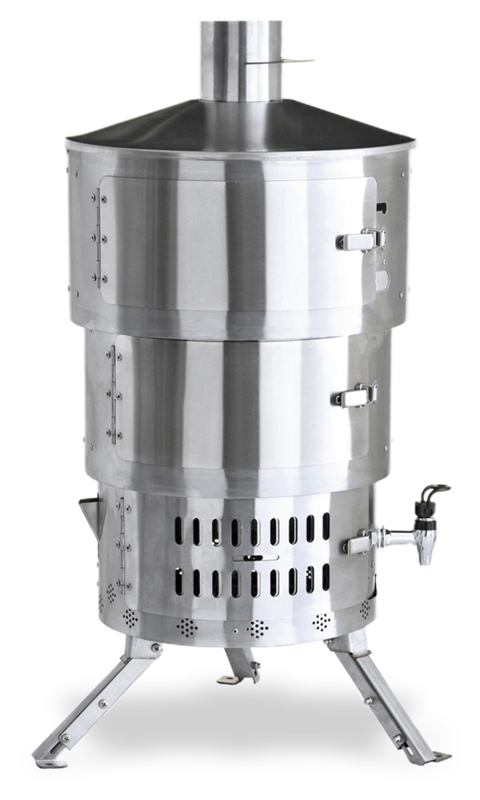 The new Piccoloforno in stainless steel offers the same benefits as an Aquaforno but is 25% smaller in size. Weighing 12.9 kg means that taking it anywhere is even easier.